The cooking can be done in just one frying pan, but preferably an oven-proof frying pan so that it can just be put straight into the oven. But if you don’t have an ovenproof frying pan, don’t panic, just move the mixture after step 17 to another tray that is oven-proof. 1) Toast the pinenuts on an oven-proof frying pan, tossing occasionally. 2) Crack 5 eggs into a mixing bowl and crumble in 300g feta. 3) Grate in 50g Cheddar. 4) Add a pinch of pepper, a couple pinches of dried oregano, zest of 1 lemon and some olive oil. 5) Once the nuts are light golden, add them to the egg mixture and mix well. 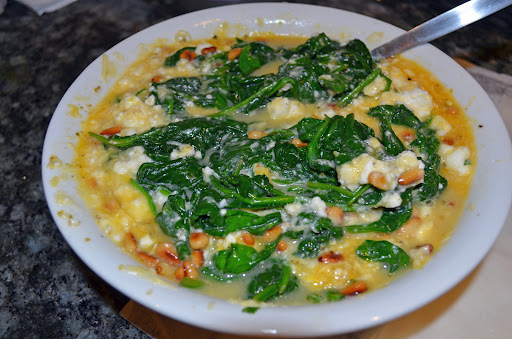 6) Put the frying pan back on the heat, add a little olive oil and a knob of butter, pile in half of the spinach. 7) Gently push and move it around and add more as it wilts down, stirring frequently. Repeat until all spinach is cooked. 8) Meanwhile, take the pastry out of the fridge. 9) Get greaseproof paper, about 50cm long and wet it. Lay it out on the worktop. 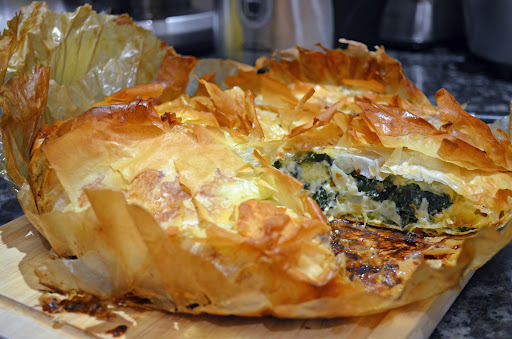 10) Arrange 4 filo pastry sheets in a large rectangle, overlapping at the edges, so they almost cover the paper. 11) Rub some olive oil over them. Sprinkle over a good pinch of salt & pepper and a pinch of cayenne. 12) Repeat until you have 3 layers, don’t worry about any cracked bits. 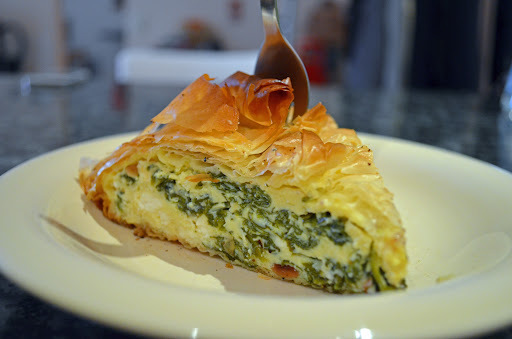 13) Once the spinach is nice and dense. Add the wilted spinach to the egg mixture and grate in 1/2 a nutmeg. Mix well. 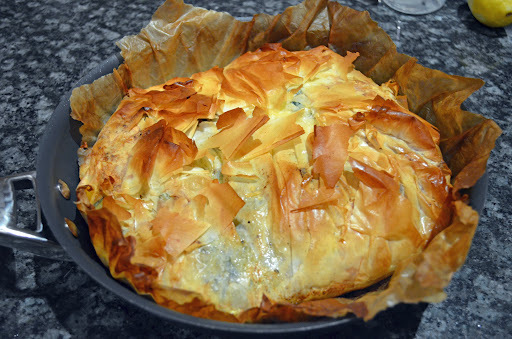 14) Carefully move the greaseproof paper and filo into the empty frying pan so the edges spill over. 15) Push it down into the sides of the pan, then pour in the egg mixture and spread it out. 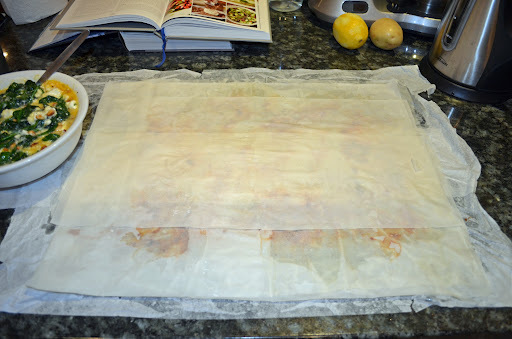 16) Fold the filo sheets over the top and let them fall where they will. heat for a couple of minutes to get the bottom cooking. 18) Then put the pan into the oven on the top shelf to cook for 18-20 mins or until golden and crisp. 19) When it’s ready, cut into slices and EAT! YUMMM! I think videos give better information especially in cooking. So these videos will be very useful when wanting to make this pie.